I am currently on day 3 of our detox. Sometime around day 3 or 4, the hungry ghost comes to visit. The hungry ghost is the creature in the artwork above with the huge belly and skinny neck. Even though it has a full belly, it is still hungry. 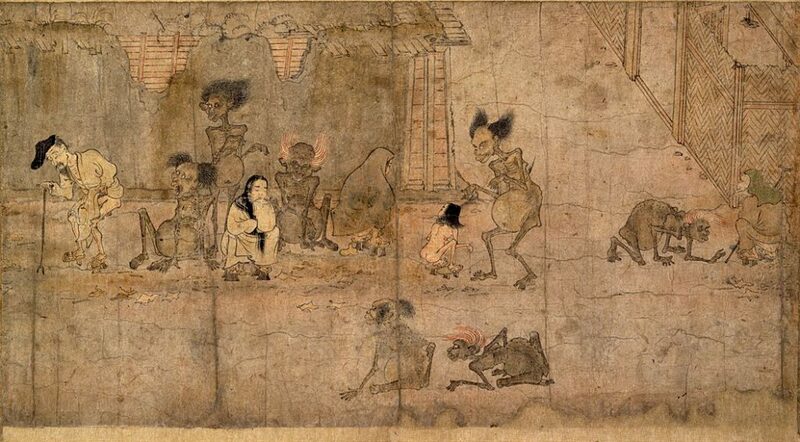 I think of hungry ghosts as cravings that never seem to be satisfied. I also consider the hungry ghost to be an aspect of my needy inner child that never got what it needed. Hungry ghosts come from those unmet needs for love, acceptance, attention, and feeling valued that we experienced as children. They are felt as an urgency to consume something in order to not feel feelings such as a lack of self-worth, being unlovable, not enough, flawed, broken, and hopeless. These are the parts of ourselves that we don’t want to hear. We don’t want to listen to that needy child and we really don’t want to feel those unwanted feelings. The tricky part is that as long as we don’t accept our hungry ghost or needy child, listen to it’s needs, and give it what it really desires (our attention), it will keep driving us towards addictive cycles. These cycles not only include the initial binging on unhealthy substances but are usually followed by a cycle of guilt and shame that circles back to more cravings. What can we do with our hungry ghosts? If we do not listen to what they truly desire and we keep quieting them with food, alcohol, or drugs, they become stronger. Fortunately, if we stop the cycle, pause, hold our hands on our heart, feel the feelings, breathe some space into the feelings, and give them our full awareness, it naturally dissipates. The cravings are how our body communicates to us. They are letting us know that something is missing and usually what is needed is exactly what that needy child wanted, to be seen, to be heard, to be noticed, and accepted. You may also try the meditation below for your hungry ghost.